In a medium saucepan, place the tomatillos, chile de arbol and garlic clove. If you are unsure of how much heat you want, add 2 chiles de arbol. Cover generously with water and bring to a simmer over medium heat. Cook for 12 to 15 minutes, or until thoroughly cooked and tomatillos are mushy, but not coming apart. Transfer the tomatillos, garlic and 1 chile de arbol to a blender. Add the cilantro, onion and salt. Puree until smooth. Taste for salt and adjust if need be. If you want more heat, add the second chile de arbol. Can I substitute a serrano chile for the chile de arbol? On your show when you were making a green salsa, you said you make it 4-5 times a week. Is this the recipe or was it one of your cooked salsa verde recipes? Thanks for your great show! Yes! Make this one with serrano chile, it will be so tasty too. I made the salsa and I enjoyed it. I paired it with the Bricklayer taco and it was delicious. After cooking the beef on the stove top, I placed it in the crock pot on low for about an hour. So glad you enjoyed it Cyrilla! I love all your recipes and have been enjoying working with tomatillos! My hubby (a Colorado native) loves your recipes, too! I made this salsita yesterday and it was so delicious! I took it out of the fridge today, and it had solidified. Any idea what happened? Can I prevent this? Hola Kai! That’s normal, all you need to do is warm it up a little and/or stir it up! Hi Patti, I made your tomatillo salsa and it was great. Since, I saw on another cooking show where instead of boiling the garlic and tomatillo’s, they grilled them and charred them a little on the outside. Have you ever done this and what would be the flavor difference. Hola! Both methods are very similar, but charring them adds another layer of flavor. I’m so happy you like the recipe! You’re a ROCK STAR! Everything you do is Awesome! Thank you for teaching me to make my favorite foods. I just made your tomatillo salsalita, I will never buy it from the jar ever again! I love your tv show! You make me want to get in my kitchen and cook! Who did your intro music for your show? It sounds so much like a local San Antonio v group. Hello Pati. I watched your show on Saturday and went out today and got all the ingedients to make the tomatillo salsa. Followed you instructions and it came out perfect. Thank you so much!!!! I will never buy salsa at the market again. Love your show. Keep up the good work. Hola Dan, Thrilled to hear you are making salsa at home now!! Thank you for watching the show! Querida Pati, To say I enjoy ur show is to minimize how I feel. U r creative & imaginative while staying true to the Mexican spirit. So much of what u do reminds me of my abuelita’s kitchen & her delicious gifts to us. Thank u so much for sharing ur enthusiasm & obvious love of cooking. I will continue to watch ur show & use ur recipes to nourish my soul. Hey Bobbie, you are so very kind. Thank you for your delightful message and for watching my show: I give it my very best on each single episode. My husband started to record your show for me. I didn’t know you had a cooking show. I love it!! My daughters love to watch, as well. I enjoy when you film in Mexico. I spent many summers traveling there with my family from childhood to adulthood. It’s a beautiful beloved country. I’ll be sure to make this salsa. 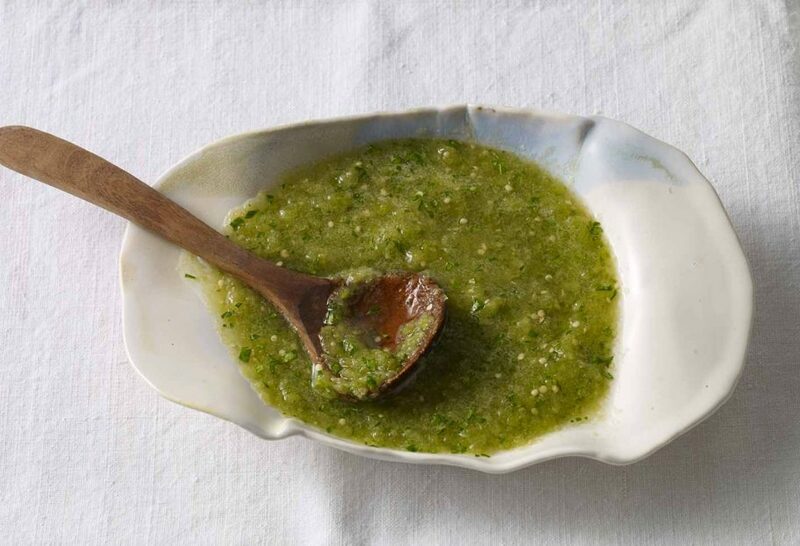 We can never get enough of any salsa at our home. I plan on trying your Brunch Enchiladas, too. I know they will be a hit. Thank you for sharing your passion for Mexican food. Hola Liz, Thank you for writing to me and, please, thank your husband for recording my show! I hope the recipes bring back many memories! !